Crystal Aero Group was founded by Captain Tom Davis, a career Naval Aviator. 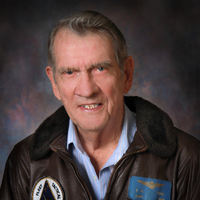 With over 70 years of flying, two wars, and a whole lot of carrier landings under his belt, this is a man who knows a thing or two about how to fly safely. For many years he was an FAA DPE (Designated Pilot Examiner) before retiring from that duty in 2018. After he and wife/business partner Gudi sold the company to James Chen in 2018, he remained on staff, still deeply involved in the day-to-day management of the company. He continues to instruct, and his extensively experienced staff of instructors carries on his legacy of exceptional training. By proclamation of local government in December 2013, Crystal River Airport was renamed in Tom’s honor for his long dedication to the sustainable and safe growth of the airport and local business community, and for providing a substantially generous annual scholarship to a local rising high school senior.